With The Bay to Birdwood nearly upon us, it's time to explore the most popular era in fashion, the 1950's. This is the last of a series of five articles for this year's event, which focusses on vehicles built before December 1959. The 1950's saw a new-found optimism after WWII, and with the return of economic growth world-wide, fashions exploded into new directions with stronger colour palettes and new exciting styles. For women, this meant a feminine, but still modest look, complete with a resurgence of petticoats and figure-controlling undergarments. 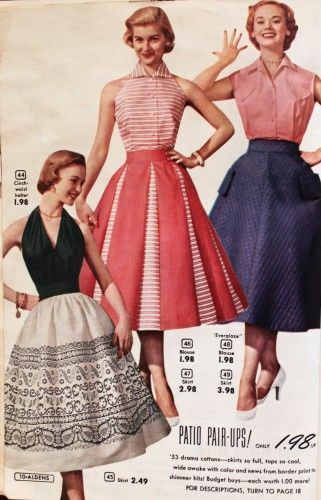 Typically women's skirts and dresses took two forms, the "swing" style, with it's A-line profile, or the tighter, form fitting "wiggle" or "pencil" style. Both started the 1950's with hemlines around mid-calf, gradually rising to the knee by the end of the decade. 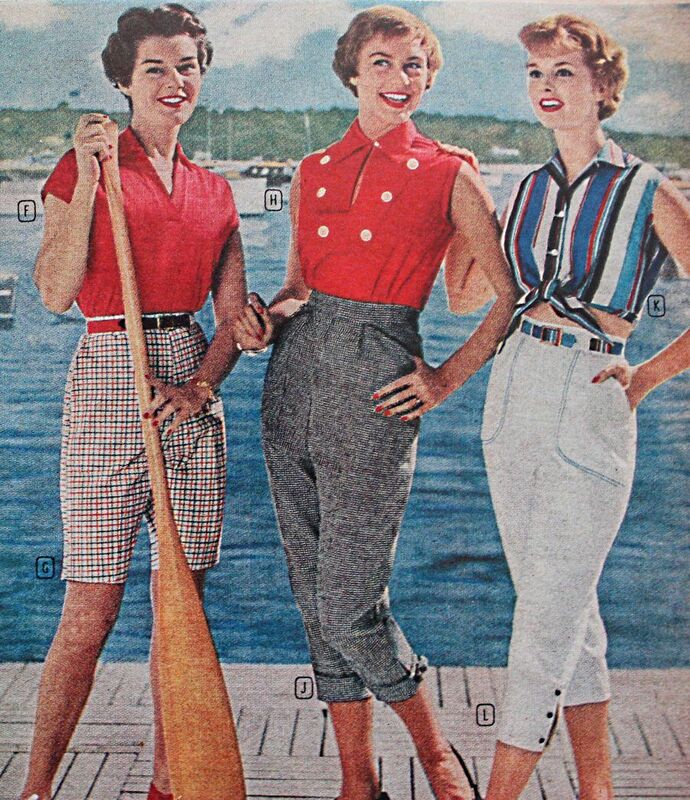 Capri pants, cigarette pants, shorts and jeans, were all popular casual wear, as were two-piece suits for semi-formal occasions, and twin-set cardigans and sweaters, which could be worn with skirts or pants to suit. The 50's lady, always set out to look her best, so all outfits were accessorised with necklaces, brooches and earrings, then coupled with matching handbags and hats when out and about. For the gents, high-waisted, pleated-front pants were common, and were worn with plain white or lightly coloured shirts, and jackets or cardigans, depending on the occasion. Suits were common fare as business attire, and these were normally heavier fabrics with tweed, plaid or pin stripes. Ties and hats were a must, when out in public. 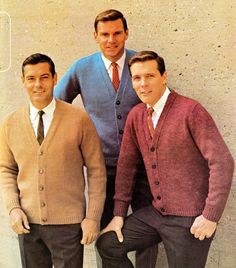 Men's casual wear, saw the use of brighter colours in checks and stripes, and these were worn with pants rather than jeans. Younger men and teenagers, often dressed down with tees and jeans, but this was not as common as TV would have you believe. 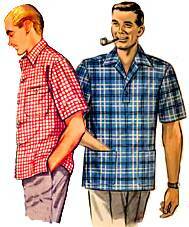 Of all the eras discussed in this set of blog's, the 1950's is the easiest era to source original clothing from. If you research carefully, and contact the vintage clothing stores in you town, you will almost certainly find something suitable. If that is too much of a challenge, there are many boutique clothing manufacturers who produce faithful reproductions. Check out Cassablanca's range of styles from brands such as Tatyana, Steady, Stop Staring!, Unique Vintage, Banned and others. Again, accessorise with period correct shoes, handbags and head wear, and make sure hair and makeup is done to suit the era. Op shops are a great place to search for items, and for men, because styles generally cycle through the decades, it shouldn't be too hard to create an authentic look using items from later clothing. Fashions for this era are very popular, and form the basis for modern genres like rockabilly and pinup. As such there are many sites on the web to research. We particularly like Fifties Web, because it covers so much more than fashion, as it delves into a whole range of lifestyle topics. Before we sign off, we'll leave you with a final pointer that the judges will be keeping an on. Style your outfits to match you age.. Eg. if you a "forty-something" lady, wear what someone of your age would wear in that era. For example, in the 1950's only young and teenage girls wore bobby socks and sneakers. (Ladies of later years wore stockings (often seamed), and shoes). Likewise, you wouldn't have seen a sixty year old gentleman, driving a 1959 Cadillac and wearing a tee-shirt, jeans and sneakers. Well, that's it from us for this year. We hope you've found these articles a little bit useful in your quest. Coming to Cassablanca in 2018....... HIRE ITEMS! Welcome Boss Babe - Miss Hayley-Brooke! What's new with the Cassablanca crew?